Comfort Blinds Perfect Arch Shades are a stationary (non-moving) shade which are made in the more traditional and most recognized shape of a half-circle (full arch). The height measurement must be exactly half of the width measurement. 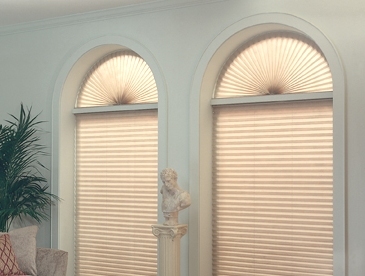 Specialty shape shades can also be made in a half arch shade (quarter-circle) or a full circle shade. The width and height measurements of these two shades must be exactly the same. Perfect Arch Shades are available in both our honeycomb fabrics and our pleated shade fabrics. Our half-arch and full-circle specialty shape shades are only available in our honeycomb fabrics.